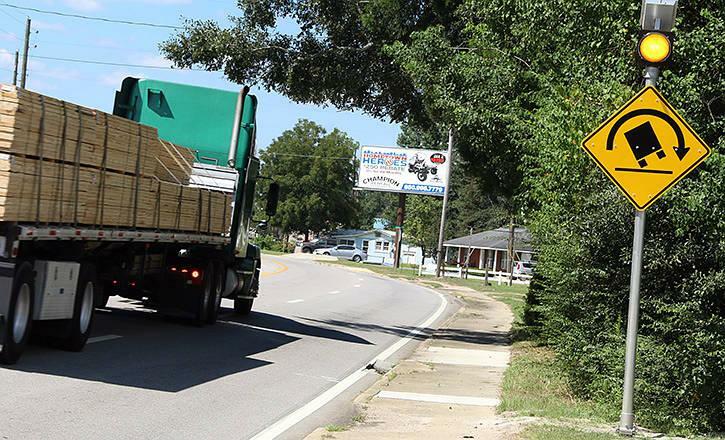 The top 11 signs for CDL drivers that could save your life. Watch the video. Hi there smart drivers, Rick with Smart Drive Test talking to you today about the top eleven signs that commercial drivers, new commercial drivers--truck or bus drivers--have to pay attention to. Yes I know that most drivers do not read road signs, and that is abundantly clear when you teach a higher class driver to drive and you ask them what speed they're going and what the speed limit is and often they don't know because they didn't see the last speed sign. However for professional drivers--truck and bus drivers--it is important to read the road signs and there are some road signs that are going to actually save your life. So it is now important that you pay attention the road signs. And today we're going to go over the top eleven road signs that I believe are important to helping you out with your day-to-day task and keeping you safe and keeping the wheels on the pavement and not spinning up in the air. We'll be right back with the top eleven road signs for new professional drivers. Stick around. Hi there smart drivers, welcome back. 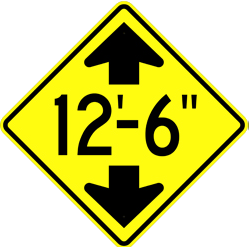 Rick with Smart Drive Test talking to you today about the top eleven road signs that new commercial drivers should and must pay attention to. so we're going to get started without any further ado. Number 11 - mile markers: mile markers give you an indication of where you are relative to a known point. For example, in British Columbia, Canada they start at '0' in Vancouver and climb as you go east. In Ohio in the United States they start at 213 at the north in Toledo, Ohio and they go down to zero as you get to Cincinnati and go '0' at the river. East- west along major highways, north-south. All of the mile markers are there and you can figure that out from a map or your GPS (Global Positioning Satellite). As well, mile markers - all of the exits have a mile marker number on them and when you're navigating to wherever you're going try and get the mile marker off your GPS, or off your map. It's going to make your life a lot easier. A couple of stories about mile markers. 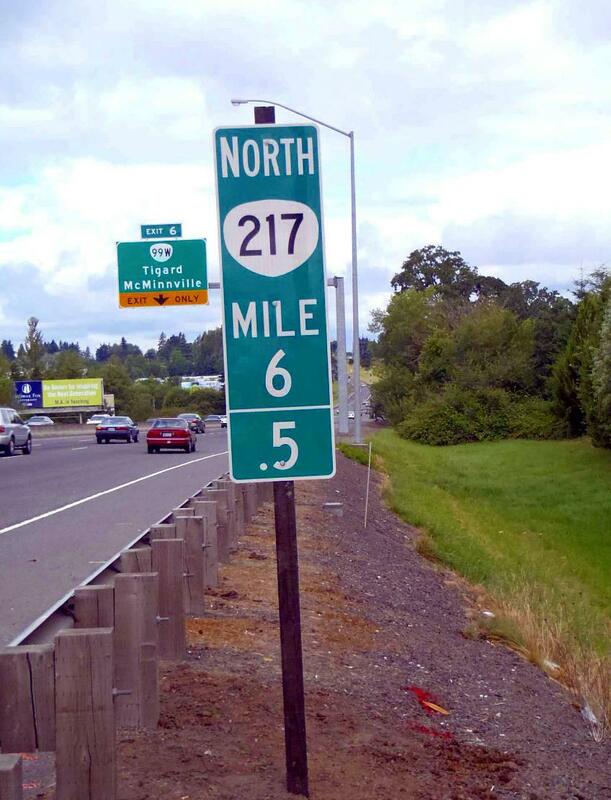 New York State's freeway exit numbers DO NOT line up with the mile markers. I was once trying to find my way on Interstate 95 through Florida. The guy told me I needed to get off of the Smythe exit - I got off at the Smythe exit, but they were two of them. I ended up in the swamp. The exit I wanted was 50 miles farther south down the interstate. So always trying to get the mile marker number. Another one is that mile markers will help you with defensive driving and I'll give you an example. 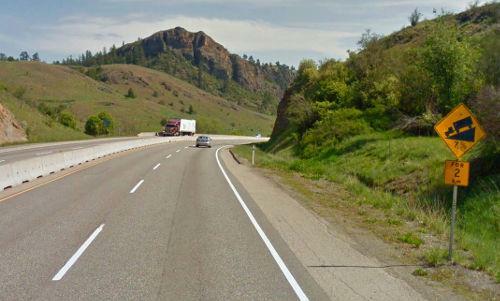 I came out of Kamloops, BC with a student and as you know for those of you who have been to Kamloops and driven on the Trans-Canada highway, there's a huge hill that goes up through Kamloops. Anyway he was in a tandem-tandem driving and there's a big fully loaded Super 'B'-- and for those who don't know Super B's run out of 63,500 kilograms or a hundred forty thousand pounds. They're really heavy trucks. Anyway he asked me if he could pass the truck, if he had enough distance. We had figured out that where he came onto the Trans-Canada was at the 370; where he wanted to get off at the exit was 378. And I said to him, "what's the difference between 370 and 378 in terms of mile markers?" He didn't know - I said it's eight kilometers, so you just came off your exit got onto the Trans-Canada - you have eight kilometers between now and where you need to get off, so of course you have enough distance to pass that truck safely and get back in in front of him to get off at your exit. So that's another defensive move that you can use for mile markers. Sign number 10 - destination boards that tell you how far you are from a city, village, or town. These are important for you to do your daily job because dispatch is going to ask you when you call them or they get in touch with you, however that is by a communications, where you are. What is your ETA--what is your estimated time of arrival at your destination or your pick up. The destination signs allow you to figure out how far you are from an known place and give you your location within five to ten minutes. And all commercial drivers should be able to give their location within five to ten minutes of where they are and how long it's going to take them to get to their destination. So destination boards are important for figuring out ETA and keeping that ETA up to date for the purposes of dispatch so they can find you another load and coordinate available vehicles with available freight. And I'll put a card up here for you for the complete video on what dispatchers do. Sign number 9 - and this may surprise some of you, but "no truck routes." You now have to pay attention to NO truck routes. It's not really that important of a sign if you end up down on that road or whatnot. You got lost or whatnot because I'll tell you right now: NO truck route sign - they're usually around the corner of the road that you're not supposed to go on. So by the time you get the vehicle turned around the corner, there's the sign and you're like well it's too late now I'm already around the corner. It's not a big deal. Get yourself off the NO truck route and carry on back onto one of the major highways. And you know when you're driving a commercial vehicle--a bus or a big truck-- that you're not supposed to be on minor suburban roads anyway. You need to be on big roads. So if the directions that you get, or your GPS is giving you take you down onto a suburban road maybe, just get on the telephone and call wherever you're going and say listen am I going the right way? Just to make sure. The only time i ever got pulled over for being on a NO truck was in Brooklyn and I was looking down the roads where the NO truck signs were and I took the one that didn't have one, but they had a bunch of people pulled over obviously there was a NO truck route sign there. Anyway they let me go because I wasn't from there and I was delivering in the area. So if you're delivering in the area, it's not a big deal. Sign number 8 - weigh scale signs. 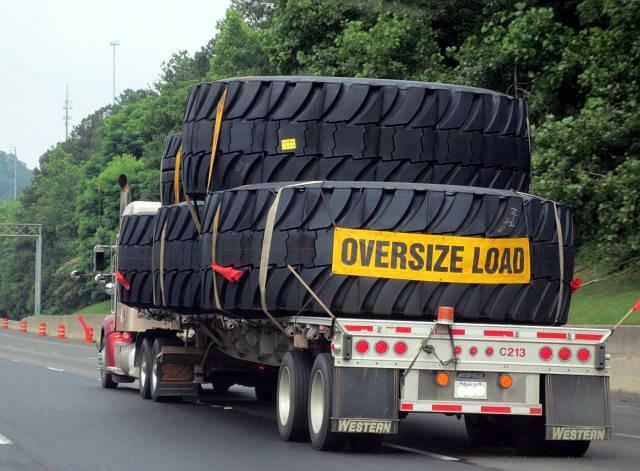 You now have to pay attention to those weigh scales because any commercial vehicle over 5,500 kilograms in British Columbia - that weight varies a little bit across the country and in some of the States. It'll be 10,000 pounds - anything over 10,000 pounds (5,500 kilograms) it goes as low as 3,500 hundred kilograms in the province of Quebec. which means the CVSE (Commercial Vehicle Safety & Enforcement) the diesel bear, the DOT (Department of Transport) in the States, the MTO (Ministry of Ontario) in Ontario - they're gonna come after you for blowing past the scale and they're probably going to give you a fine. So pay attention to the weigh scales. There's usually two signs: there's an advanced warning telling you that the weigh scale is there and telling you that in fact it is open and you have to go in. You only have to go in if it's open; you don't have to go if it's closed. So weigh scales - pay attention to those signs. And as well, if you get a commercial GPS, it will tell you where the weigh scales are or if you get a map-- an atlas from a truck stop and whatnot-- it will also have the location of the weigh scale, so you can be looking out and pay attention to where those are. 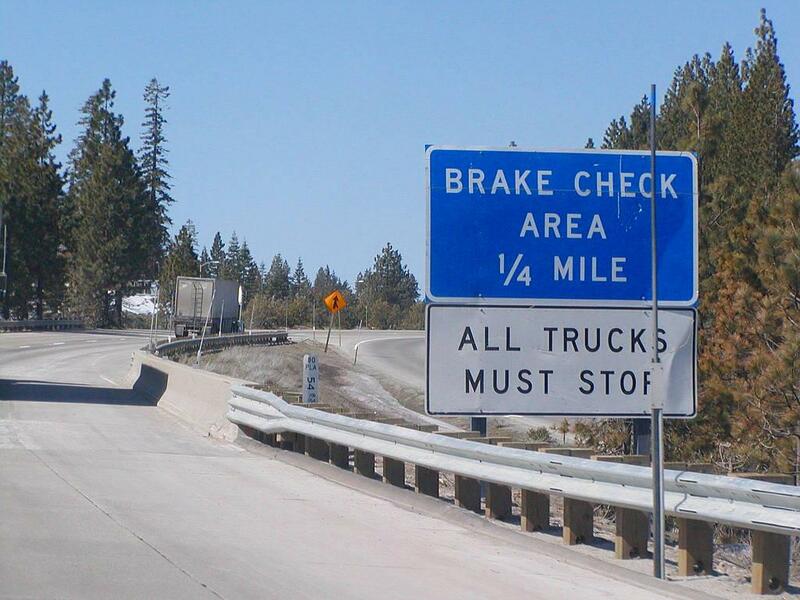 Sign number 7 - brake checks. Yes you have to go into the brake check and you have to stop and check your vehicle before you descend down the hill. And as well, the other thing I'll say about brake checks, make sure that you stop and put a flag in your logbook, which is just the line down; a vertical line down that indicates that you stopped at the brake check and where the brake check is. You don't have to change duty status, you just have to put a line in the logbook. That way it's due diligence on your part that you did in fact stop at the brake check. That way if something happens when you're going down the hill it's written down. Because you know that old saying: "if it ain't written down, it didn't happen." So brake checks - stop at the brake checks. 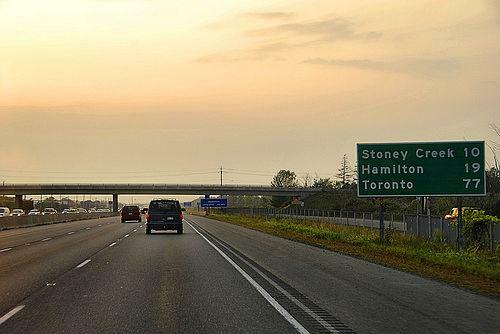 You have to stop the brake checks, and if the diesel bear--the DOT, the CVSE, or the MTO in Ontario--are sitting there and you blow by the brake check - again you're probably going to get a fine. Sign number 6: oversized signs. You'll usually see the pilot car before you see the oversized vehicle, but some oversized vehicles do not have a pilot car. 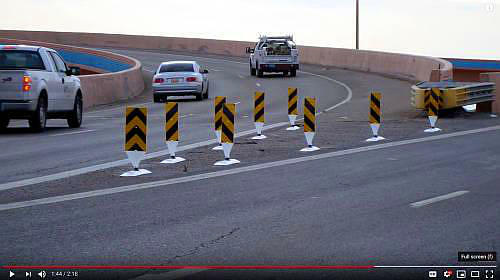 And pilot cars, just on the note of pilot cars - if you do see an oversized load with a pilot car on a two-lane skinny-- two lanes going in two directions--the pilot car will be in front. On a multi-lane highway with an oversized vehicle, the pilot car will be in the back. So if you're coming up and you see the pilot car in front of you, you'll know that there's an oversized load in front of you. And the reason that this is important and the reason that I put this at number six is because you know that you need to give it more space. Especially if you're on a two-lane skinny, you might actually have to pull over to the shoulder of the road, depending on how big that oversized is. So you now need to pay attention to this sign - the oversized sign on other vehicles. And I did have a student once do that on a multi-lane road - pulled up at a stoplight beside an over dimensional vehicle. And I was like, "what are you doing?" Because there's like an inch between the mirrors. So don't do that...okay. If it's an over dimensional, give them lots of space. Sign number 5 - lane designation signs. Pay attention to the lane designation signs over top of the roadway. Because if you're turning left or right and there are two turning lanes to the left, for example, you always have to be in the outside lane, regardless of whether you're turning right or left. You need to be in the outside lane in a big truck, in a bus, or any oversized vehicle. Because if you're in that inside lane, I guarantee you there is a concrete island over in the middle of the intersection that you have to get that vehicle around and there's usually a light standard on it you'll get jammed up in there. If you're lucky you'll get it stopped before you actually strike the light standard. But it's very embarrassing when you have to stop, you have to back up in traffic, you have to move around and get that vehicle out of there. And how do I know that? I know that from experience, because I did that when I was green. So lane designation signs - if there's two turning lanes, regardless of where they go--right or left-- always, always in the outside lane. Sign number 4: object marker signs. 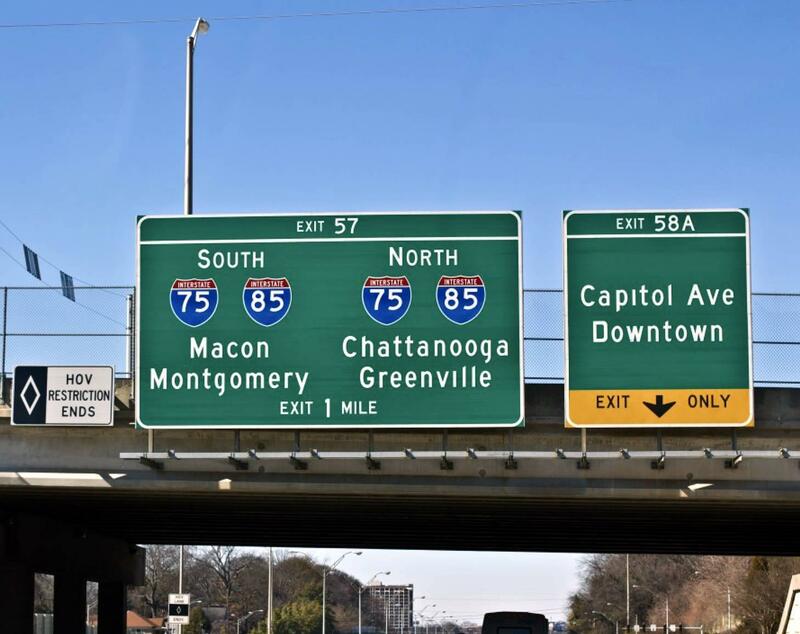 As you can see here in the image, these signs, no doubt, are the most prolific signs on our roadways and highways and warn you of hazards and obstructions that you could potentially hit on the roadway. And now that I've pointed these out to you, you will see these signs everywhere. On the end of bridge abutments, concrete islands, all kinds of places along the roadway. Any hazard that you could potentially hit. And it's important when you're driving a bus or a big truck you pay attention to these and you give them a wide berth so you don't run into them, especially when they're on the edge of bridge piling and the lane goes on one side of the bridge piling or the other side of the bridge piling - you need to pay attention to those, and again I'll put a video up here for you on object markers so you can get more information about those. Sign number 3 - height signs. Yes, driving a large commercial vehicle, you now need to know the height of your vehicle and you need to pay attention to height signs. 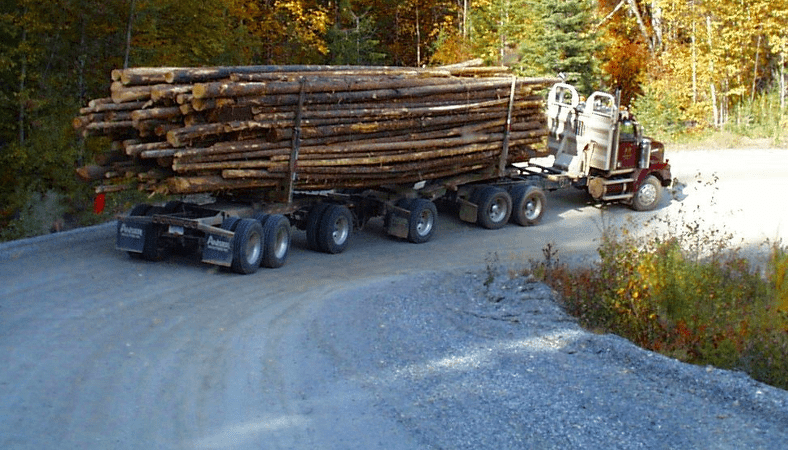 You need to know as a commercial driver that the maximum legal height of your vehicle in Canada is 4.15 meters or in the United States that it is 13 feet 6 inches. If the overhead obstruction is lower than that, if the sign says four meters you cannot go under there with a big vehicle. And if you're in the United States, if you're in any state except New York, if the sign says 13 feet you can't go under there either. So height signs are going to take the top of your vehicle off if you don't pay attention and it's too low. And also know that the city of Chicago has 2,500, two thousand five hundred low bridges and overpasses. So pay attention to the low clearance signs. 4.15 meters in Canada; 13 feet 6 inches in the United States. Sign number two - we're getting close, Sign number two is curve signs - these curve signs [pointing to the sign] because in a large vehicle you need to power through the curve. And I don't mean accelerating ,but you need to power through the curve. So you need to recognize the curve sign, you need to slow down before you get to the curve and be in a gear that allows you to power through the curve, especially if you're pulling a trailer. Because if you have a trailer on, the last thing-- especially with winter coming on--you never ever ever want that trailer to push you, because that trailer weighs anywhere from five to eight times what the tractor weighs. And you need to be pulling it with the tractor to maintain control of the vehicle. You get a bit of ice or snow on that curve and you may end up in the proverbial rhubarb... in the ditch. So make sure you pay attention to the curve signs, and as well you always need to move the top side of the curve. That way you can compensate for off-tracking. 2) and you need to slow down before the curve so that you can power through the curve. And when I say power through you don't need to be accelerating, just gentle power so that you're pushing or pulling the vehicle through the curve. And the number one sign that you now need to pay attention to as a bus or truck driver...are grade signs. These will save your life. You need to know how to downhill brake correctly and I'll put a video up here for you for the complete video on downhil braking, but pay attention to grade signs. If its single digit and you're driving a 13- or 18-speed transmission you can go down in five low with Jake on full. If it's more than single digits, if it's ten percent or above, you need to pick a lower gear, probably down into forth with Jake on full. If you're driving an automatic, you need to get down into a low gear with the Jake on full. These grade signs are important because they are valuable piece of information that will allow you to be able to go down the hill without using the brakes so you don't experience brake fade. Again I'll put a video up here for you on brake fade. grade signs - pay attention to the grade signs because these signs could potentially save your life. Quick review: so sign number 11 is mile markers. You need to know where you are along major highway. Mile markers will also be on exit ramps and when you get directions from your GPS or the phone... calling the place where you're going and what not, you can get the exit number and it makes it a lot easier because you can get prepared to exit off the roadway because you know you'll be 10, 12, or 15 miles away--or kilometers here in Canada-- from that exit. So that way you're not at the last minute scurrying over to the right-hand lane to try and get into that exit. As well, number ten "destination boards" - you should be able to have an ETA within 10 or 15 minutes at all times, and be able to update that as you're driving up and down the road all the time, so that dispatch can get you loads and keep you working and making more money. Next one, number nine is "no truck routes." Don't end up in a suburban area, don't end up on an NO truck route. If you're hauling furniture or something like that, it's a little bit different, but for the most part hauling general freight and driving buses you shouldn't be on a NO truck route or no bus route. Weigh scales - as driving a commercial vehicle you now need to pay attention to weigh scales and you need to go into the weigh scale because if you blow past the weigh scale, like I said there's nothing they like more than get in there little vehicle, chase you down the road and give you a fast driving award. So pay attention to weigh scales. There's always a warning sign farther back...a good kilometer ormile down the road that will tell you whether the scales are open or not. Brake checks - stop at the brake check. 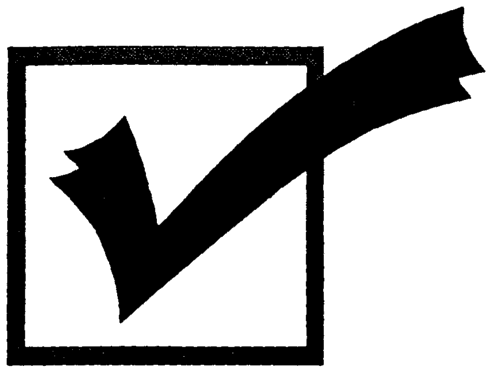 Put a notation in your log book, if you're keeping a log book or put a notation on your timesheet saying that you stopped at the brake check. That way if something happens when you're going down the hill you've done due diligence. And remember that saying, "if it isn't written down, it didn't happen!" Number six - oversized vehicles. Oversized signs - do not cram yourself in beside another vehicle that is hauling over-dimensional freight. You're risking a crash or a collision with that vehicle. Number 7 - lane designations. Right or left, you always need to be in the outside lane. 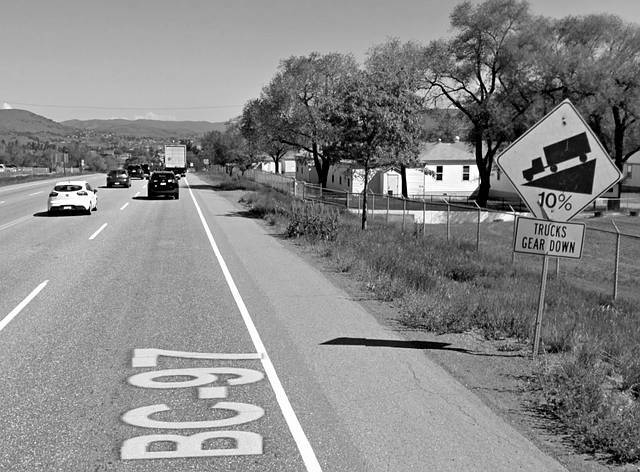 Number 8 are object markers which warn you of hazards and obstructions on the roadway. And as I said, now that you know that they're there, you're going to see those signs everywhere. You need to know that in Canada it's 4.15 meters and in the United States it's 13 feet 6 inches. If it doesn't say that on the sign or greater, don't go under. Or if you do want to go under and you try going under, at least go slow and get out and look from a distance to see whether in fact you can go under that overhead obstruction. And I'll put a complete video up here for you on overhead obstructions. 2) and as well, you need to be pulling or pushing that vehicle through the curve to maintain control, especially if you have a trailer on. The last one is grade signs. Grade signs can save your life because they'll give you the information that you need to be able to downhill brake safely and effectively all the way down the hill. What do you think of my list of signs? 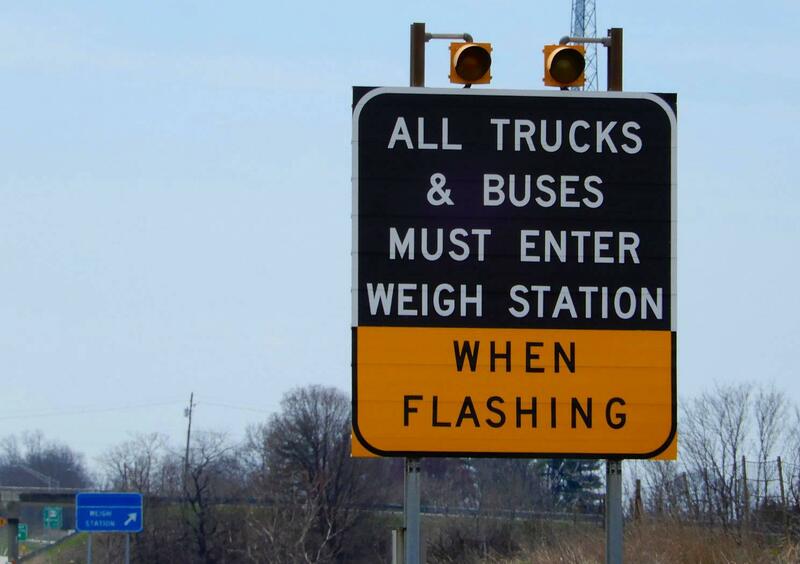 What order would you put those signs in for new commercial drivers? Which signs do you think are the most important to pay attention to for new drivers who are starting your career as a bus or truck driver? I'm Rick with Smart Drive Test. Thanks very much for watching. If you like what you see here share, subscribe, leave a comment down in the comment section - all that helps us out. As well, hit that thumbs up button. Check out the videos below; if you're on a mobile device check out the videos in the upper right hand corner there. 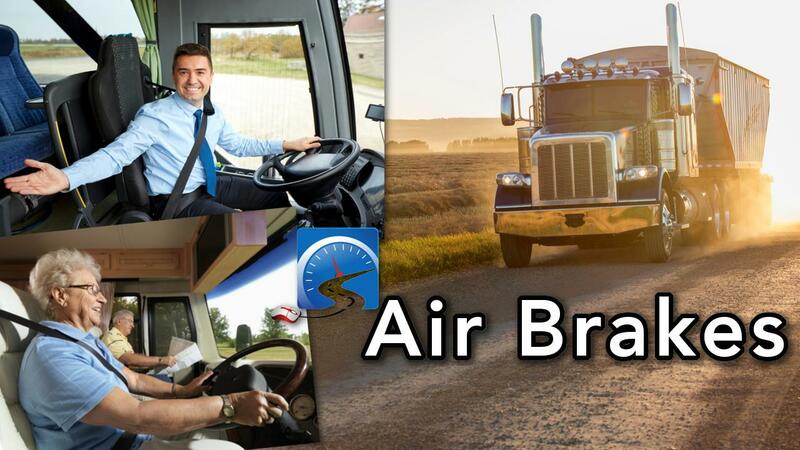 All the cards will give you links to the great information for those of you endeavoring to get a license or start a career as a bus or truck driver. Thanks again for watching. Good luck on your road test and remember, pick the best answer, not necessarily the right answer. have a great day.